Whose bedtime is it now? Maddie’s grandmother, MiMi got the royal send off Friday night as the little girl pulled out all the stops to protest Denise’s departure back to Virginia. Maddie got her dander up around 6:30pm and her grandmother stepped in to quell the riot. Unbeknownst to her, things were just beginning to heat up. It seemed like everything was in control when I left to run some errands about an hour later – but that assumption was not entirely correct. I arrived home a little after 10pm to find a quiet house where everyone was surely asleep. I deduced that my wife’s parents were sleeping upstairs and Gina and the baby were sleeping in the bedroom. Nice quiet night – good times. But…Hmmm, I wonder why the light is on in Maddie’s room? I gently pushed the door open and low and behold it was Denise (MiMi) and the baby. I could see right away that MiMi was hanging on by a thread. She was fighting the good fight and rocking the baby, but you could tell that Maddie had pushed her to the brink of exhaustion. I knew right away that the standing 8-Count had already been given and MiMi was done. I heard the tale of the tape and realized that MiMi had fallen victim to the boxing term known as the rope-a-dope. A rope-a-dope is a method a boxer uses to wear down his/her opponent by inducing them throw a tiring series of exhausting punches that do little to no damage. Once the opponent is tired out – you bust them in the dome and collect your prize money. Maddie had been faking out MiMi all night long by using a series of loud and angry complaints to answer whatever method MiMi used to try and calm the baby down. These are many of the same tactics Muhammad Ali used to beat George Foreman before the Foreman name became synonymous with burning greasy burgers and pulsating smoke alarms in dorm rooms across America. Maddie is pretty good with the strangers, but once she gets to know you – all bets are off. After her three-hour bout with Maddie Friday night, the question that is now hanging on everybody’s mind is – Will MiMi ever come back? 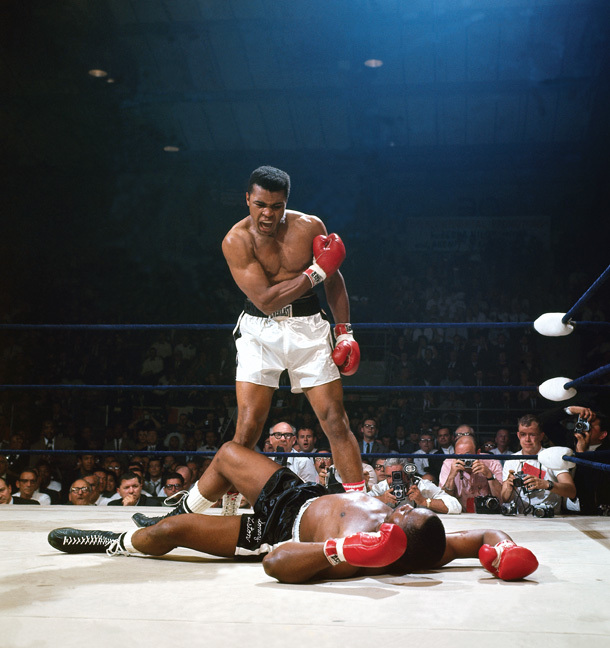 This entry was posted in Anger Management, Sleep Habits and tagged baby, boxing, MiMi, Muhammad Ali, Rope-A-Dope.